Advanced Broadcast Camera Techniques Vol. 1 & 2 reveals over 900 examples of the best camerawork, and how to do them. Over 100 chapters and 160 minutes of teaching that guarantees to improve your camerawork 50 percent or more or your money back. You may think you are a good cameraperson now, but wait until you watch these videos. You will be shocked by how much you will learn that you are not doing now. Also includes a two-page shot list for you to carry with you to the job. These are the videos everyone is talking about! Home Video Hits: Great Ideas for Producing Better Home Videos! is an entertaining video that shows you how to make better home videos using The Direct Approach, a unique step-by-step method that guarantees improvement in your home videos. 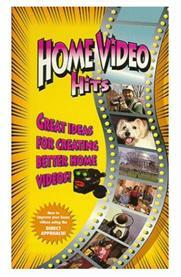 Home Video Hits: Great Ideas for Creating Better Home Videos! is produced by an award winning team of writers, producers, animators, camera operators, and editors. The videotape is accompanied by a handy reference booklet -- small enough to fit in any camera bag -- that outlines important tips for improving home videos. 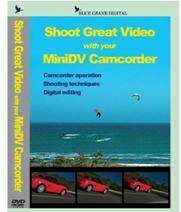 Complete program on 4 DVDs will improve your video making skills. Start making videos that you'll be proud to show! How To Shoot Super Videos is a complete course for making videos, presented in an easy to understand, entertaining format. Whether you're just getting started in video, a serious enthusiast, or you produce videos for a living, you will benefit immensely from the professional instruction provided in this 4-DVD instructional series. When you apply the techniques shown in this program to your own video making, you'll get greater enjoyment from your camcorder. With the proper skills, you can even profit from a full or part time video production business. Wouldn't you really like to grab your audience's attention with exciting compositions, smooth camera moves, great lighting and crisp sound? Learn to tell a story with video using proven techniques for continuity. Bring your messages to life with the magic of videotape editing. Dramatize your productions with music overdubbing, audio mixing and voiceovers. Add professional looking titles and special effects. Incorporate still photos, slides and even old home movies in your videos. It's all covered in How To Shoot Super Videos with superb, easy to follow instruction featuring hundreds of video clips and graphics. How to Shoot Super Videos is the most complete program for video enthusiasts ever produced, on four 75-minute DVDs with easy-to-navigate menus to find and review each topic covered. 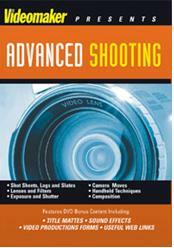 DVD #1 illustrates still photography concepts and how to compose shots. These basic principles will teach videographers how to shoot video like a pro. 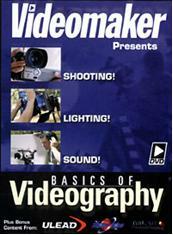 DVD #2 covers camera techniques, including panning, tilting, dollying, booming and zooming. Learning when and how to use these moves will help make anyone's video much more interesting to watch. This DVD includes a bonus section on how to transfer movie film, slides and photographs to video. 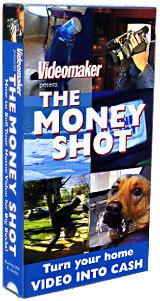 DVD #3, entitled Continuity and Combining Shots, will help video enthusiasts make videos that tell a story. The result - no more boring videos. Both in-camera editing and shooting to edit techniques are illustrated. 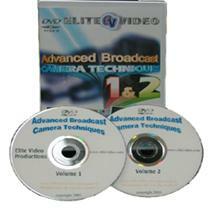 DVD #4 teaches practical techniques to improve video making with two very important modules, Lighting and Sound. The emphasis is on maximizing the end result with minimal expense on extra equipment. The JumpStart Guide to Shooting and Producing Better Videos - This 60 minute DVD will help you shoot and produce great looking and sounding video. Your new digital camcorder can capture memories that last a lifetime, but getting great results can be difficult. By understanding a few simple techniques, and the software already on your computer, you can make exceptional home movies that everyone will enjoy. This DVD takes you through the steps necessary to shoot great video, tell a compelling story, and edit the results into something you will want to share with your fiends and family. Within an hour, you will be thinking about video in a whole new way. Your videos will instantly improve, and you’ll have more fun than you’ve ever had with a camcorder. Cut weeks or months off your learning curve. We’ll show you how to make great videos without spending more money on expensive software or additional hardware. Get the results you want without going to film school! TechTV's Digital Video for the Desktop provides instruction from TechTV experts on how to make and send movies from a PC. Michaela Pereira and Martin Sargent guide the viewer through choosing a digital camera, planning a shoot, and editing. Further instruction includes computer requirements and editing tools, software and importing video, editing and adding effects, as well as how and what to output. Martin goes on location to shoot a demonstration video with a digital camcorder covering the TechTV softball team in action, and then uses this footage as the basis for creating the video on the PC. Michaela Pereira and Martin Sargent provide the latest information and tips to help the viewer film more professionally, transfer video to a PC, edit using software packages (such as MGI Videowave and Pinnacle Studio) as well as ouput video to multiple formats.Viewers can pause the video to see written definitions and site addresses to ensure their understanding and further learning. Michaela Pereira and Martin Sargent guides the viewer through choosing a digital camera, planning a shoot, and editing. Further instruction will include computer requirements and editing tools, software and importing video, editing and adding effects, as well as how and what to output. Martin goes on location to shoot a demonstration video with a digital camcorder covering the TechTV softball team in action. He then uses this footage as the basis for creating the video on the PC. The primary focus of this video will be on editing and outputting. Michaela Pereira has been a favorite on-air personality at TechTV since 1998. As the former co-host of Internet Tonight, Pereira surfed the wild world of the Web to bring viewers the Internets most useful, and most bizarre. As one of the current hosts on the Tech Live news team, Pereira brings viewers the most comprehensive technology news available in a nine and a half hour live, daily format.Prior to joining Tech TV in 1999, Martin Sargent was an editor at PC Computing magazine. On The Screen Savers, Martin delivers daily top five lists, field segments, and is also a frequent guest host. Today's home entertainment systems can have 6 or more separate channels of sound. This gives videographers the opportunity to impress their audiences with an amazing audio experience. Impressing your audience with great sound is impossible if you do not have good quality audio to begin with. There are many challenges videographers can face when recording audio outside of a studio environment. We have prepared this DVD from our weekly vidcast series to prepare you for those challenges. In this DVD, our editors prepare you with the knowledge and skills you need to record high quality audio with boom, lavaliere and wireless microphones. Be ready to record live events and interviews. Our experts share their insights and ideas gained from years of experience in recording audio for video in the field. Watching DVDs is an effective and enjoyable way to learn videography. You will be very glad you watched this one when you are ready to edit your video with the clean, clear audio recordings you learn how to capture in this DVD. This DVD is a collection some of our best segments on recording audio for video from Videomaker's weekly tips and tricks series. It includes 10 segments on how to capture or create the sounds you need to enhance your video. Shooting videos outdoors can sometimes be a bit trickier than inside because you're often working in an uncontrolled environment. Making the sun and nature's wild sounds work for you are just a few of the shooting challenges you'll learn from this DVD. 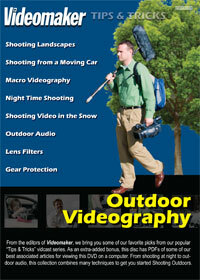 In this DVD, the experts at Videomaker go beyond the basics and teach you to refine your shooting skills and tell a better story. · Shot Sheets, Logs and Slates - How to use shot sheets, storyboards, logs and slates to effectively map your shots and boost the quality of your production. · Lenses and Filters - Use filters to protect your camcorder's sensitive components, improve shot quality and create interesting effects. · Exposure and Shutter - Charge Coupled Devices (CCDs), using your camcorder's iris to manipulate depth of field, using shutter speed to control exposure. · Camera Moves - Learn the ins and outs of dollys, trucks, arcs and cranes. How to improvise on the cheap. · Handheld Techniques - Using your body to make your shots smooth and stable. Image stabilization - optical, electronic and with a Steadycam. · Composition - Get beyond the "Rule of 3rds." Converging lines, depth of frame, lens compression, using focus, the "Hitchcock Zoom," and how to shoot moving subjects. This is the first VHS ever to reveal the trade secrets of selling home video to local and national television shows for big bucks! How to sell your home video for big bucks!